There really is something about Italian words that make everything sound so sophisticated. 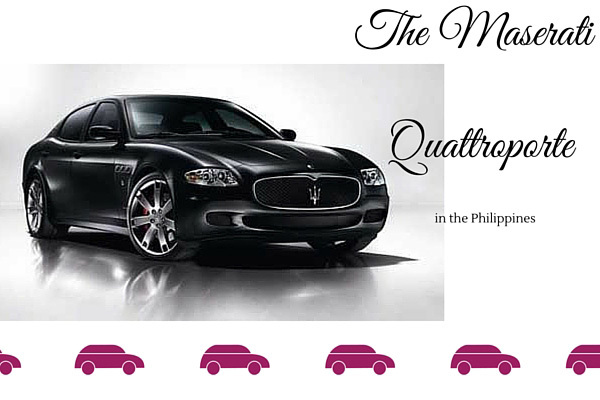 Just like this beautiful car from Maserati they call the “Quattroporte” which really just translates to “four doors”. But imagine if you had one, you can say, “I have a Maserati Quattroporte,” and that truly sounds so classy and sophisticated. The Quattroporte comes with a 4.7L V8 engine that shows that it isn’t all about style because it is also about power. My friend told me that he went to the Maserati dealership in Buendia, Makati and got a chance to start its engine and rev it. The engine supposedly has this exploding sound when you put the pedal to the metal. Something about the turbo and the oil or something like that. So really this car is really not all looks but can also satisfy those who have the need for speed. Also, just look at it. It is so beautifully designed and crafted. It is a symbol of elegance in harmony with power. For those who have the money, this will surely be one of those must-haves. As for me, I can just keep on dreaming and drive it around on video games.